ST. BONAVENTURE (MARCH 31) – St. Bonaventure’s lacrosse team has let it be known that this is a new year and they have high expectations. “I want to make it to A-10’s this year,” goalie Karly Kocis said. The Bonnies have not made the Atlantic 10 playoffs since 2007. However, with new coach Ryan Lynn, the Bonnies hope to achieve that goal this season. The Bonnies played their first A-10 match-up yesterday against Temple, losing by a 12-4 score and now have 2-3 (0-1) record. “We are slowly but surely starting to change the culture and get us back to where we want to be,” Lynn said. Lynn arrived at St. Bonaventure after being the the defensive coach at Le Moyne College. He has brought that same style to St. Bonaventure. “We are just going to run a pressure defense, so what that means is that we are going to push out on the ball and then the two adjacents are always going to close the driving lanes,” Lynn said. “It’s not just you and the person you’re guarding, we work as a whole together,” Savage said. The team has already shown improvement from previous years. Against No. 12 Ohio State, the Bonnies managed to keep the game close at the beginning, but did not have enough offense to upset the Buckeyes. Callahan, who had 38 goals last year, scored three goals in the season opening win against Niagara. But she has since been sidelined due to an injury. Lynn understands that dedication is the only way to turn a program around. “If I am going to put expectations on them, I better make sure I maintain expectations on myself,” Lynn said. In their last four games, the Bonnies have outshot their opponents by an average of .823 along with saving more shots on goal than their opponents. It hasn’t just been Lynn’s changes to the program, but new faces have also impacted the Brown and White. Freshman Mackenzie Jordan, whose sister Stephanie, played for St. Bonaventure in 2004-2008, is excited to be part of the Bonaventure family. “I like (playing at St. Bonaventure) because we can relate to a lot of things”. Jordan has five points so far in the season,” Jordan said. 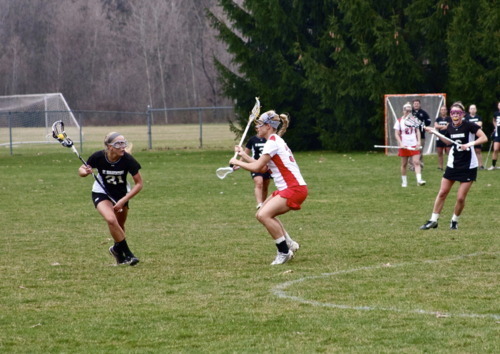 Other freshmen who have contributed are Jenna Barber, who has one assist and Taylor Ventre who has three ground balls. But it’s the veterans who are leading the way. Sophomore Erin Thompson and senior Danielle Drabin lead the team with 11 and 13 points respectively. In goal, the Bonnies have switched between Karly Kocis and Sara Schlagenhauf. Both have been effective, but Lynn has yet to choose his starter. While the Bonnies have shown improvement from last season, there’s still room to grow. For instance, a weakness has been turnovers where the Bonnies have committed 51, but have only caused 15. Rising from the ashes of past losing seasons is a St. Bonaventure team ready to play for a bid to the A-10 Championship.